The first juicy apples from our BIOapple garden in Zvanitchevo village are already in stores. 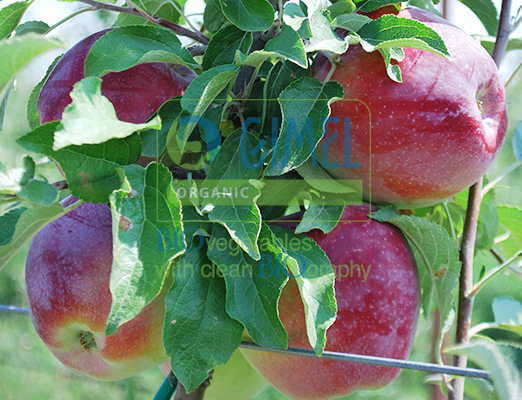 We grow the apple trees on healthy balanced soil. We do not treat them with chemical pesticides and preparations. Our apples are aromatic and rich in vitamins and minerals. We recommend a fresh BIOapple a day! You can make your apple meal various with fresh juices and smoothies. An apple slice is a great addition to every fruit meal for the kids. An apple puree or nectar is great for your baby. We pay attention to you that the apple peel and the seeds contain the most precious substances – do not throw them away as you do with those from the chemically treated fruits! You can find all BIOfruits and and BIOvegetables of Gimel Organic in the supermarket chains all over Bulgaria, and in the two company stores HEALTHY ZONE, as well – in Sofia, 23 Arsenalski blvd. and in Varna – Mall Varna, level -2.